If you’re spending a few days in Cádiz and fancy a day trip out of the city, there are some wonderful destinations nearby. From Jerez de la Frontera, the home of Spanish sherry, to some of Andalusia’s most beautiful whitewashed villages, all of these gems are within an hour by car or train. Read on for the best day trips to take from Cádiz. Jerez de la Frontera is one of Andalusia’s best-kept secrets and is less than an hour away by car or train from Cádiz. This elegant, whitewashed city is famous for two things: sherry and horses. In order to fully immerse yourself in its culture, attend one of the amazing equestrian ballets staged by the the city’s Royal Andalusian School of Equestrian Art and follow it up with a well-lubricated tour of the cellars of Tio Pepe or Gonzalez Byass. The old Moorish quarter is the city’s most beautiful area and richly rewards aimless wandering. If you’re visiting Cádiz in August, a day trip to Sanlúcar de Barrameda is a must. 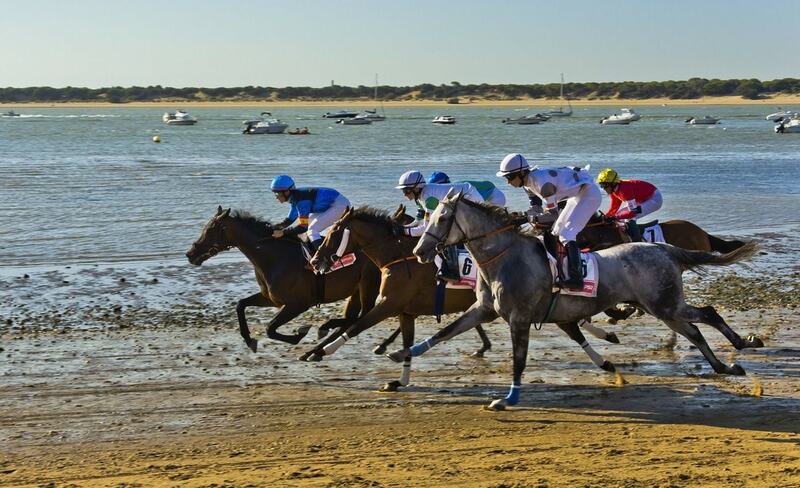 In the second and fourth weeks of that month, the town’s beaches are the spectacular setting for one of Spain’s most famous hosrse races, in which around 80 riders from all over Europe compete for prize money that runs into hundreds of thousands of euros. Sanlúcar is also on the northern point of Cádiz’s “Sherry Triangle” and produces deliciously sweet manzanilla wine, which is an ideal companion to the superb seafood you’ll also find here. Located just thirty miles to the east of Cádiz (about 45 minutes by car) is the Parque Nacional La Suara – ideal for day trippers who want to totally forget about the city for a while. The shaded pathways of this 217-acre park run through thick pine forest and in between rows of eucalyptus trees, providing some perfect picnic spots along the way. Perhaps the best way to appreciate La Suara’s natural beauty – which over 50 species of bird call home – is to ride through it on horseback, an experience which many local tour agencies can arrange. 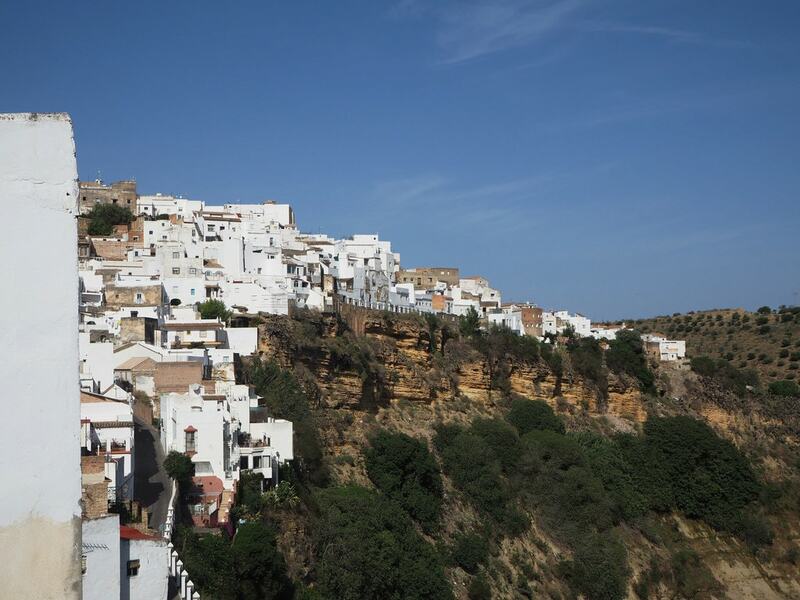 One of Andalusia’s most attractive pueblos blancos (white villages) perches dramatically on top of the Peña Vieja hill, its sugar cube houses looking out over the verdant expanses of the Guadelete valley. Not for nothing is this achingly romantic place (situated just 45 miutes by car from Cádiz) often called Spain’s most beautiful village: pretty much every house on its winding, cobbled lanes looks like something straight out of a fairytale. At the top of the old quarter is the Castillo de los Arcos, from which you can take in panoramic views of the surrounding countryside. Another of the region’s ridiculously beautiful pueblos blancos, Vejer de la Frontera is 35 miles to the south of Cádiz and sits atop a deep gorge carved by the Barbate river. Make Plaza España, the old town’s principal square, your first stop upon arriving: surrounded by elegant whitewashed townhouses and palm trees is a fountain decorated, in typical Andalusian fashion, with colourful ceramic tiles. From here, cross under the Arco de la Villa and explore the village’s oldest barrio – an enchanting maze of timeless streets and squares scattered with welcoming local bars. The Parque Nacional de Doñana is one of Spain’s best national parks and is located just a fifty-minute drive north of Cádiz (access is through the town of La Algaida, which sits on the banks of the Guadalquivir river). Its untamed expanses of sand dunes, pine forests, wetlands and lakes are home to one of the richest varieties of fauna and flora in Spain. 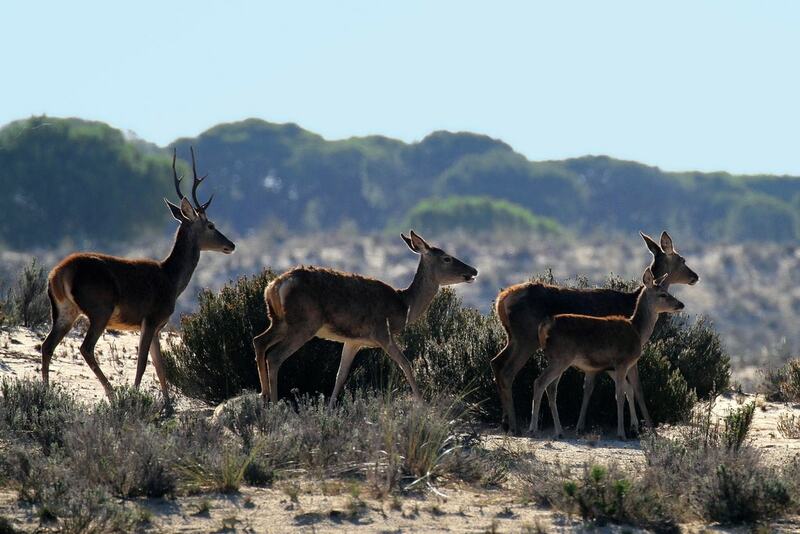 The best ways to explore Doñana are by hiking or cycling, both of which will give you plenty of opportunities to spot the park’s two most impressive residents – the Iberian lynx and the Spanish imperial eagle. Along with Arcos de la Frontera and Vejer de la Frontera, Medina-Sidonia is one of Cádiz’s most beautiful and unspoilt pueblo blancos. Located just a half-hour drive from the provincial capital, it offers the day tripper a traditionally Andalusian old town, at the centre of which is the beautiful Plaza de España. Just off the square is the 17th century Town Hall building, which features an impressive Renaissance façade. If you’re staying for lunch or dinner, head to La Vista Medina, where you can enjoy some breathtaking views from the restaurant’s external terrace.